I received two boxes this week! 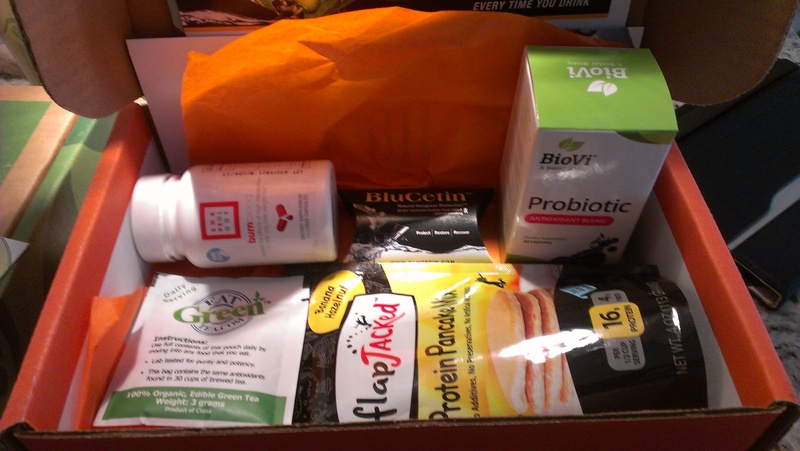 One is my weight loss subscription and one is the normal BuluBox! Here is the rundown of what I thought of each one! FlapJacked Protein Pancakes: I haven’t made these because the ingredients include milk. I’m lactose intolerant and don’t consume dairy, so I will make these for the boyfriend when he gets in the mood. He’s more of a cereal or waffles guy, so that may take a while! EatGreen Tea: This was weird. I opened it up and tried some, but it just tasted exactly like dry green tea! I think it should be more of a snack OR powder to add to smoothies. It simply is loose leaf green tea. This product seems to be having an idendity crisis…or just is trying to pull off marketing of something that is edible, yet not very tasty! Shapeology Burn Blend: Hello Caffeinne! I’m in a detox-mode right now to help cure my leg injury and reboot my adrenal glands, so I have not indulged in this supplement. It was nice of them to give 14 pills to try. I may take some later, after I’m all healthy, but right now high caffeine dosage is not recommended! BluCetin: This is VERY interesting! It is an herbal pill that promises to not be a buzz kill, yet prevent you from having a hangover. It says the herb helps you metabolize the alcohol faster (Hello Light Weight and Cheap Drunk) so you will have it processed before you pass out from a night of drinking. Again, not planning on having 5 drinks quite yet, but 4th of July is 2 weeks away and this pill WILL be taken! Probiotic: I love probiotics and consume many different types. From kombucha, to Kevita, to VegaOne and my multi-vitamin, I support healthy digestion. These will be taken also! You can’t really judge the effect of them since you can’t see your insides, but it’s a nice free sample. Theragesic: This actually works. I mean, IcyHot is old as I can remember, and this is another one of those muscle rubs. It definitely lasts at least an hour and warms up where ever you rub it. It has no “icy” sensation, only warm, and I love the menthol smell. GU Chomps: My boyfriend and I both had one of these “gummies” and it was very chewy. Not quite a gummy bear, not quite a fruit chew, and HUGE. Way too big for my liking. Taste was OKAY. I wouldn’t purchase them. PowerFuel: The text on the back of the packet is tiny so it’s really hard to see what is this powder exactly. It promises you will work 1000% time harder than usual, but I don’t see how that is possible. One stick is 45 calories and contains a TON of lab-made ingredients that I can’t pronounce. Not for my taste. 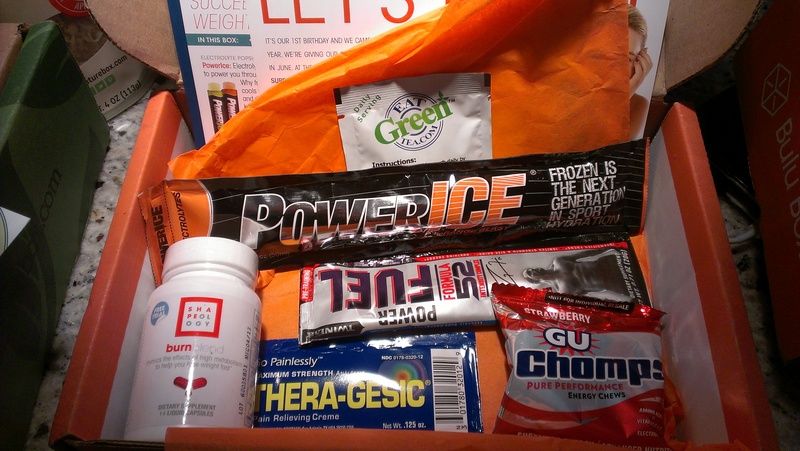 Power Ice: An electrolyte popsicle? Isn’t this a Pedialyte? I love getting surprises each month! I really like how BuluBox leans more towards natural supplements, even if it includes a few here or there that I won’t ingest. But we’ve all got friends who love gifts now, don’t we? Thanks Bulu! See you next month! IF YOU WANT TO TRY BULUBOX FOR FREE, ENTER CODE BULUGAN143 AT BULUBOX.COM TODAY!